We all have heard plenty about the emergence and then dominance of e-commerce over the brick and mortar retail stores. This is not just fluff or random theories. We have data to support these claims. According to Statista, Retail e-commerce sales worldwide were 2290 billion US dollars and are expected to rise to 2774 billion in 2018. This is just the beginning, we can expect a lot more growth in the near future. As the business grows, so does the customer base and obviously the support queries. This calls for a helpdesk management system powered by the right features to give a boost to your customer support process. 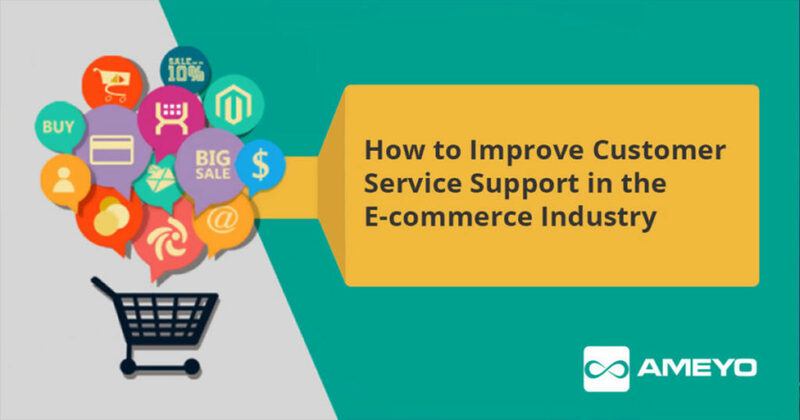 Following are some of the ways to improve customer support in the e-commerce industry. Imagine, a prospect or a customer is surfing your website/mobile app and has a quick question. Nothing too complex or detailed. Something very basic. They are looking for a quick chat with your rep. In addition, they might even want to have a short call about it as well. All this and much more can easily be done with a helpdesk software which supports all the channels that your target audience frequents. For instance, John has a discount coupon for shoponline.com and is surfing the website for a pair of trousers. After spending some time and shortlisting a few items he goes ahead to make the payment. But, while applying the coupon he faces some issue and decides to initiate a web-chat. The agent addresses the problem and gives John a different code which is he applied successfully. Now, this is a simple query needing a quick response. If John had to wait in the queue for long, it would have been a waste of time and lead to a bad experience. Now, John placed the order and is waiting for it to be delivered with an ETA of 2-3 days. But the shipment is not delivered. On the fourth day, John calls customer support from an unregistered phone number. Once he connects with the agent and asks about the order status by providing his order number, the agent is at a loss. Since John has called from an unregistered number, the agent is not able to locate John in the CRM. This leads to John being angry and threatens to escalate the issue. In the above case, due to a lack of a helpdesk ticketing system, the agent was not able to track John’s order. With a ticketing system integrated with the order management system, the agent simply has to punch in a unique identity code (order number, registered mobile number, etc) can view complete details of the customer along with historical interactions and any pending deliveries or tickets. Additionally, it is always better to keep the customer in the loop by sending them timely updates via SMS, email or push notifications. So, if John was notified about the possible delay along with the reason and an updated ETA, he would not have to go to the trouble of reaching out to the contact center. Customers do not like to be pushed around in circles and definitely do not like to be misinformed. Talking about John itself, suppose he calls in to check his order status and then drops an email for the same. It is important that the same information is communicated to him on both the channels else it will lead to confusion and spoil the experience of the customer. Moreover, even though millennials prefer online shopping but there is still a significant portion of the population who go to the store to make the final purchase. These customers might first browse the website to check out the available products and then go to the retail outlet to try and finally buy the product. This implies that for any brand which offers a hybrid shopping experience i.e. sells via a brick and mortar outlet as well as via online channels, it needs to have a good inventory management solution. It will ensure that the inventory data on your website, app and in-store match, irrespective of the channel through which the customers are viewing your products. Once the package is delivered, the nature of customer support requests changes. For example, John received the trousers from shoponline.com. But when he tried them, the fitting was no right so he raised a request to return the package. A customer support system allows John to view the real-time status of his request and notifies him about the ETA of the pickup boy. Similarly, the agent also gets complete visibility of customer’s journey and is thus, empowered to take the query to a satisfactory solution. Moreover, any e-commerce website or brand have a number of vendor partners and, successfully managing them is as important as managing the customer support requests. It is important to have a ticket management system which integrates with any in-house or third-party system to maintain the vendor details. This will help to tie any loose ends and make the customer experience delightful and one to remember. Previous postWhy Adoption of Cloud Contact Center Is Increasing? Next postWhy Do We Need A Strong Call Center Software In FinTech Industry?